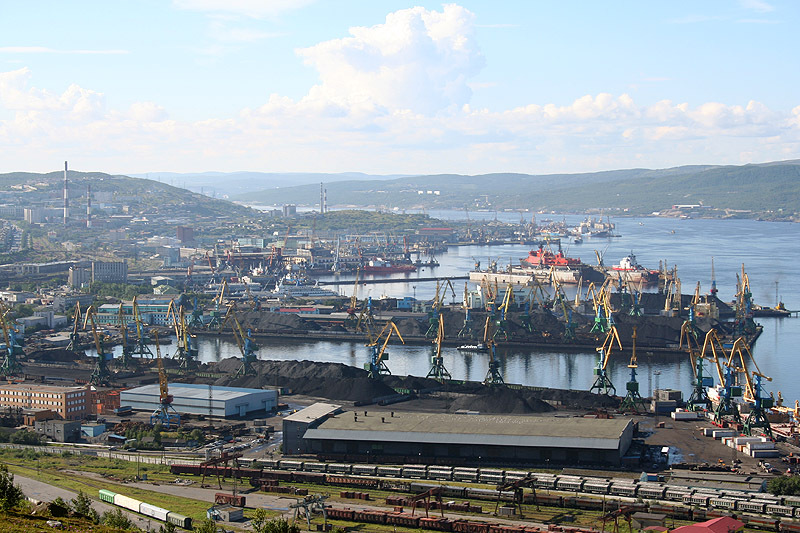 Murmansk (Мурманск) is one of Russia's most important seaports and naval bases. It is located north of the Arctic Circle, on the Barents Sea and on the Kola Peninsula near Russia's borders with Finland and Norway. The city, Romanov-on-Murman (Романов-на-Мурмане), was initially founded in 1916 when a railroad line to the Kola Peninsula was built. I am under the impression that this railroad and then the port was meant to help war supplies reach Russia during the First World War. The city was renamed Murmansk after the Bolshevik Revolution. During the Russian Civil War, troops of the Western powers (French, British and American) occupied the city as apart of the Allied Intervention . Murmansk is a strange city in many ways: it is above the polar circle, so it endures weeks of total darkness in the winter and enjoys weeks of 24 hour sunshine in the summer. It is above the tree line; the trees peter out a couple of hundred miles to the south. It is above the 10 degree isotherm; that is a line drawn around the arctic where the average June temperature is 10 degrees Celsius or less. And last but not least, despite cold winters, the sea doesn't freeze (because of the Gulf Stream). Go in winter, and you can have air temperatures of -16 degrees Celsius, with great clouds of steam coming off the water and hanging over the port area as fog. The people of Murmansk are generally kindly but very few speak English. Lots of places in the surrounding are military areas and they are not marked. You should not take photographs in such places or in the harbour unless you don't want to be stopped by the military police. 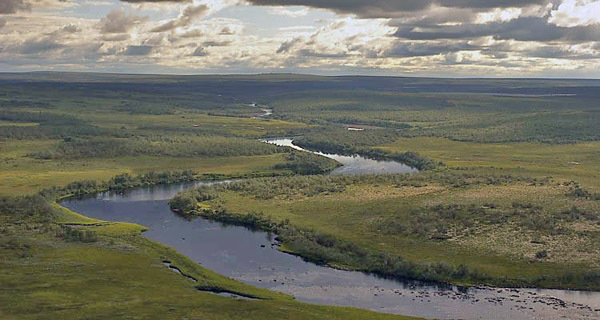 The Kola Peninsula (Кольский полуостров) is the peninsula on which Murmansk is located. It borders on the Barents and White Seas, and thus onto the Arctic Ocean. The climate on the Peninsula is relatively mild due to the influence of the arm of the Gulf stream current in the Atlantic that reaches the Barents Sea; so there is taiga in the south and tundra in the north. The peninsula is rich in iron ore, titanium and other minerals. There has been major industrial and military (largely radiation) pollution on the peninsula. Unfortunately, there is no "Superfund" program in Russia yet. 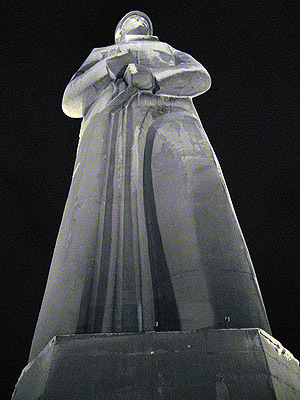 This is the Alyosha Statue erected in 1974 on a hill overlooking Murmansk in memory of those who died during the Second World War, "the defenders of the Soviet North during the Great Patriotic War 1941—1945." The statue is an immense granite soldier, over 100 ft. tall, with a rifle slung over his shoulder, facing the west (from where the German invasion had come). An eternal flame burns at the feet of the statue. During World War II, the German army, with some Finnish help, launched an offensive against Murmansk in 1941 in attempt to capture the city. The intent was to secure the German left flank during the invasion of Russia and also to cut off the flow of war supplies to Russia (see below the Murmansk convoys). However, fierce Soviet resistance in brutal weather conditions prevented the Germans from capturing the city and from cutting off the vital railway line. The city of Murmansk was almost entirely destroyed in the process. During World War II, Murmansk was the key link with the Western world for Russia, since the harbor did not freeze in the winter. War supplies could be landed there and then shipped via the Karelian railway into Russia. It took a dedicated effort on the part of the U.S. and British navies and merchant marines to keep the convoys of war supplies going to Russia as the Germans used submarines, surface warships such as the Tirpitz, airplanes and short batteries based in Norway to try and stop the Murmansk convoys. There was also the the fierce Arctic weather. This made the Murmansk convoys, especially in the early years of the war, extremely hazardous duty. There are some fascinating websites that contain both the recollections of sailors and merchant mariners who served on the Murmansk convoys and also other historical materials. The Murmansk Run, is part of the official web site of the US Navy Armed guard. The navy armed guard consisted of enlisted US Navy personnel who were stationed on merchant ships to man the guns and other armaments that had been installed to protect the ship. My uncle served in the armed guard, but not on the Murmansk run. Russian Convoys, lists all the British naval convoys to Murmansk with details about each one. Naval Armed Guard Service: Convoys to Northern Russia-an Overview and Bibliography, This is a very good short overview of the convoys and a list of some good books. 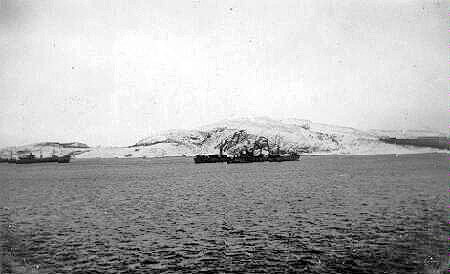 The PQ-17 convoy to Murmansk, June 1942, suffered the most catastrophic losses of any allied convoy during the Second World War with 25 of 36 ships lost. There is much information available on the web, including the wikipedia article which is a good introduction. See also Recent Developments Concerning the Ill-Fated Russia Bound Convoy PQ 17. Finally, take some time and see the classic, old, action movie Action in the North Atlantic (1943) starring Humphrey Bogart and Raymond Massey. It is worth seeing. Remember that it was done in 1943, so it has some propaganda qualities, but it is still considered a relatively accurate depiction of what the sailors of the US merchant marine experienced on the Murmansk convoys. Note that there were no sub-titles used for the German-speaking U-boat seamen in this movie.